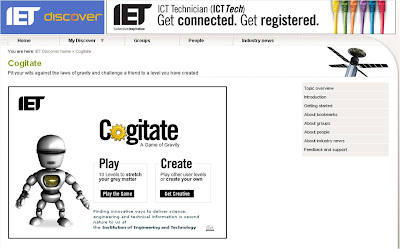 'Cogitate' is a new game from the Institution of Engineering and Technology. Cogitate is being used to generate traffic / attention for 2 new IET initiatives - IET Discover (a collaborative global social bookmarking site) and Inspec Direct, a new research tool that gives access to the world's scientific and engineering literature. Cogitate is a multi-level game, based on the laws of physics and and includes (officially) approved LEGO Technic pieces. 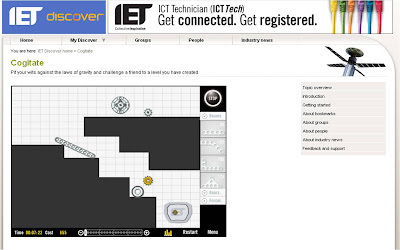 There are 10 pre-designed Cogitate levels + the ability to create your own level and share it. Cogitate is a great example of how social and social gaming is not just something for Facebook and iPhones - it can work for business messages too. Social principles can be applied to B2B objectives and with over 500,000 visits so far, the IET's Cogitate game is clearly working as a traffic driver for the IET site - time will tell if this increased awareness has translated into increased usage of IET Discover and Inspec Direct.